Testimonial Fader installation, capabilities, features and options. Note: This documentation applies to Version 5.2 and above only. Download the TestimonialFader_UNZIP.zip file from the email you have received after purchasing the extension or from the Store website. UNZIP the file TestimonialFader_UNZIP.zip. You will find a ReadMe.txt file and installation file (pkg_testimonial_fader_vX.x.zip). Choose the option Upload Package File and select pkg_testimonial_fader_vX.x.zip. This will install both Module and the Component. 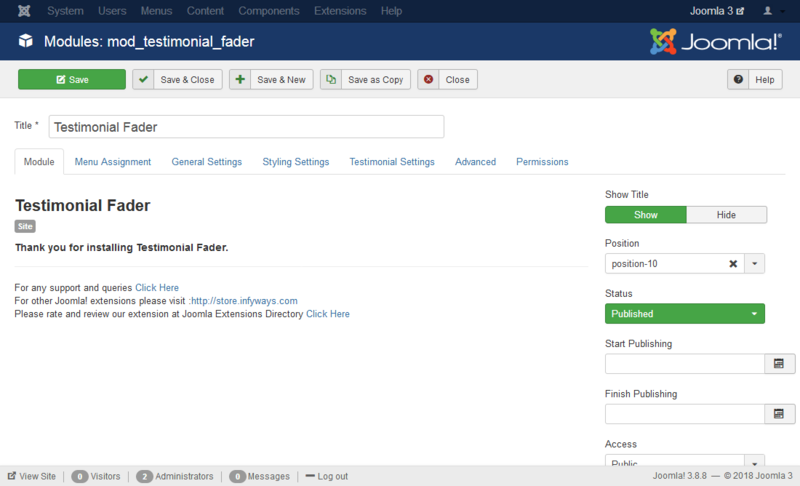 After successful installation of the module, go to Extension > Modules and Search for Testimonial Fader. If you don't find it in the modules page then click on the New button in the top left corner of the page and add Testimonial Fader Module. After opening or adding a New instance of theTestimonial Fader module you can find different tabs with different parameters to set. Position : Set the position of the module where you would like the slideshow to appear. In general settings tab you can set the dimension and animation settings of the testimonial fader module. Testimonial Speed : Sets the time period of the animation effect to be displayed for a testimonial. Timeout : Defines the time delay between two testimonials. All units are in milliseconds. Testimonial Order : Set the order in which you would like the testimonials to appear. You can choose Random or Sequential. 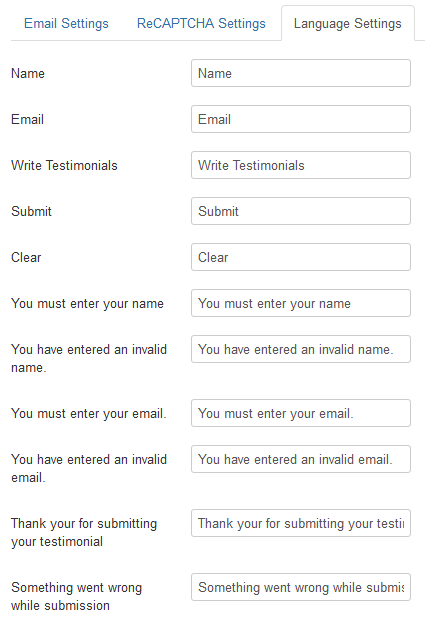 Using the module, the testimonial form can be submitted without page refresh. The module can be published in any of the module positions available in the template. The text and the reCAPTCHA can be configured in the Component Options. All other functionalities can be managed in the General Settings of the module. Width : The width of the form can be in percentage(%) or pixels. Example : 100% or 300px. Additional Top Text : HTML or plain text can be added to the top of the form. 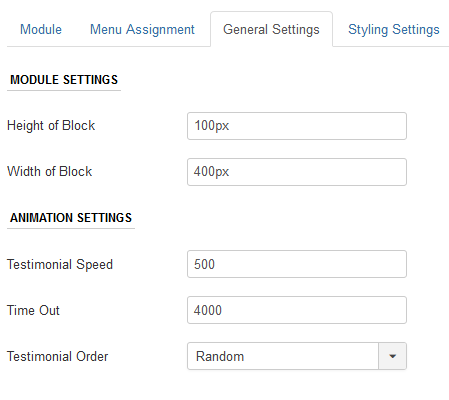 In Styling Settings you can set the testimonial font style, author style and quote styles of the Testimonial Fader Module. Testimonial Font : You can use your own font, Google Fonts or the template default font. Font : If you want to use Google Fonts then go to https://fonts.google.com/, select a font name and add it to the field. For example you want to use Open Sans font the just mention Open+Sans in the field. Testimonial Font Size : Set the size of the fonts in pixels. Ex : 14, which means 14px. Testimonial Color : Select the color of the testimonial which you would like to appear. Testimonial Font Weight : Set the font weight to bold or normal. Show/Hide Author : Option to show or hide the Author of the testimonial. Author Font Size: Set the size of the fonts in pixels. Ex : 12, which means 12px. 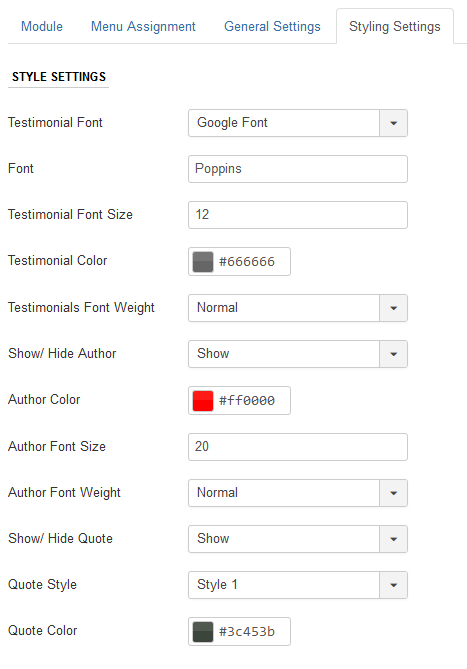 Author Font Weight : Set the font weight to bold or normal. Show/Hide Quote : Option to show or hide the quotes of the testimonial. Quote Style : Select the quote style from the list of 8 different styles. Quote Color : Set the quote color of the testimonial. In the testimonial settings you can set the testimonial source, limit the characters. Testimonial Source : You can either select the source to component or from the module which has to be added using the slides option. Read More : You can link the testimonials to open in a new page, inside a popup or set to none. Number of Character: Number of characters to appear per testimonial. The rest characters will be stripped. Read More Link : The option will appear only if the Read More is set to "Link to a Page". Read More Text : Add the read more text which you would like to appear. Open In : Option to open the read more link in a new or same page. The option works only when the Read more is set to "Link to a page"
Slides : Click on the (+) button to add a new slide. 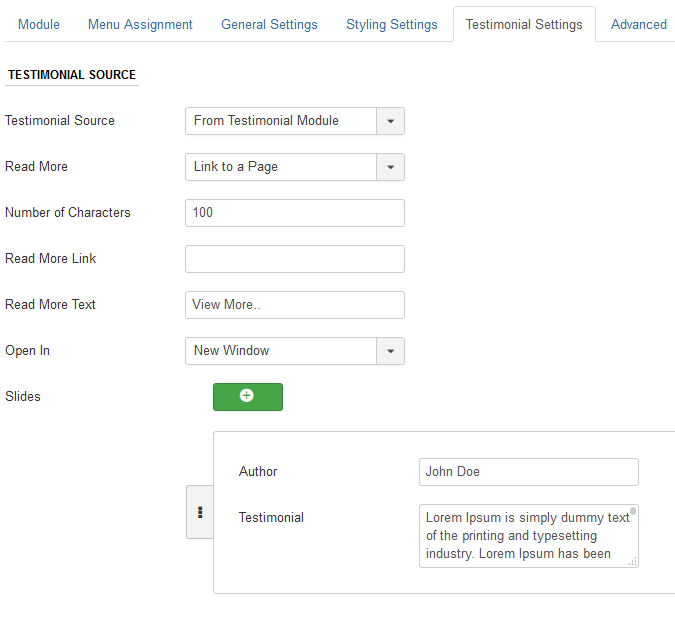 Once clicked, the option to add Author and Testimonial will appear. Fill it if you want the testimonial source to be Module. Include jQuery Files : You can include the jQuery files of the slideshow inside the head tag or in the body to avoid any jQuery conflicts with other modules. After setting the module, Go to the backend Components > Testimonial Fader and click on the options in the right top side of the screen. Upon clicking the following options will appear. Email Subject : Set the email subject you would like for the testimonial notification email which will be sent to the above email addresses. Example : New Testimonial Added. The language of the form and the messages can be set in the language settings. The component has three different options which can be published in the frontend of the website. 1. Submit and View Testimonials : Layout to submit and view the published testimonials. 2. View Testimonials : In this layout the published testimonials will only show. 3. Submit Testimonials : A visitor can only submit the testimonial from the frontend. 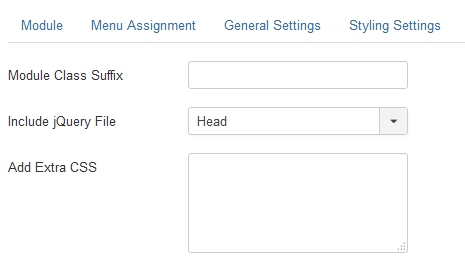 To add Menu, go to Menus in backend and click on Add New Item. Select the menu type and Click on Testimonial Fader, the above three options will appear. Select the one you would like to have and go to the options tab to set the other parameters like pagination and order.